Ages 5 through 8. Help children improve vocabulary usage and communicative competence using the high-interest games and activities in this kit. The game activities target category words/concepts, vocabulary definitions, and interactive communication. Category Words and Concepts. This deck addresses children's abilities to think about basic categories and classifications. Example: Name something that crawls. Daily Living Words and Concepts. This deck focuses on children's knowledge of basic facts or "world knowledge." Example: The sweetener that insects make is called __________. Vocabulary Definitions. This deck focuses on common words and their meanings. Example: What is a city? Interactive/Pragmatic. This deck focuses on various types of social exchanges as children make requests, give information, and direct others in an interactive context. Example: Ask a person near you what his or her middle name is. Create a Question. This deck focuses on questioning skills as children create their own questions from pictured stimuli. Example: What do we use a nail for? The game facilitates the development of communicative competence by focusing on three primary areas of interpersonal interaction: pragmatics, semantics, and world knowledge. The kit includes a full color playing board, five card decks, and a spinner. Regular Price: $39.00 Save money now! 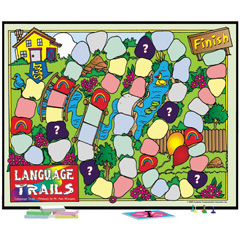 Language Trails-Both Games (Primary and Intermediate)-Special price $46.00!